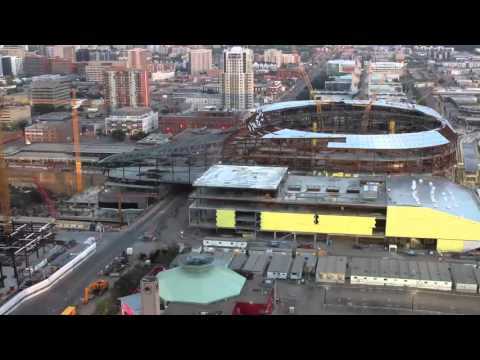 Rogers Place and the ICE District meld an iconic architectural design and new development with Edmonton’s well-established commercial and residential neighborhoods. HOK, in association with ATB and Dialog, was commissioned by the city of Edmonton and the NHL’s Edmonton Oilers to design a new arena and to oversee the master plan of an adjacent mixed-use district and plaza. The arena and district represent a significant reinvestment in the city fabric by the Oilers Entertainment Group. One of the challenges was connecting the arena to the ICE District and Edmonton’s downtown. HOK and planners proposed extending the arena’s footprint over the main thoroughfare—104 Avenue—to connect the two parcels of land identified for development. This elevated, multipurpose entryway, dubbed the Winter Garden, is enhanced by street-level commercial development. The covered extension creates bold connectivity, a physical presence and a distinctive brand identity that reinforces the street grid and activates Rogers Place and the ICE District year-round. The ICE District, envisioned in collaboration with Shugarman Architecture + Design, WAM Development and Hariri Pontarini Architects, will be a lively mixed-use development spanning 25 acres. The district includes a community rink, private development, office development, residential units and parking spaces, as well as a connection to an existing light-rail system. The arena design creates a premium experience for every guest. Seating options include 3,100 club seats, 900 PCL Loge seats, 500 drink rail seats, 300 ozone club seats, 57 Scotiabank executive suites, 24 theater boxes, three clubs, two club lounges and Curve, a full-service restaurant. The arena features the NHL’s largest high-definition scoreboard, at 46-by-46 feet, as well as more than 1,200 HDTVs. As Canada’s first LEED Silver-certified NHL arena and the second in North America, the facility is designed to use 37 percent less water and 14 percent less energy than conventionally design venues. Since opening in 2016, the arena has surpassed attendance expectations for sporting events, community events and concerts. The venue hosted numerous sell-outs for the Oilers and the largest-ever attendance for the Western Hockey League’s Edmonton Oil Kings. Sports Management named it one of the best stadiums of 2016. The fan-oriented arena and adjacent ICE District are expected to invigorate the urban core and catalyze additional downtown development while extending Edmonton’s existing footprint and communicating its civic character. HOK’s design of Rogers Place supports the Edmonton Oilers’ goal for developing the NHL’s first LEED Silver arena in Canada.